Dining on delicious home cooked food, washed down with tasty local wine! 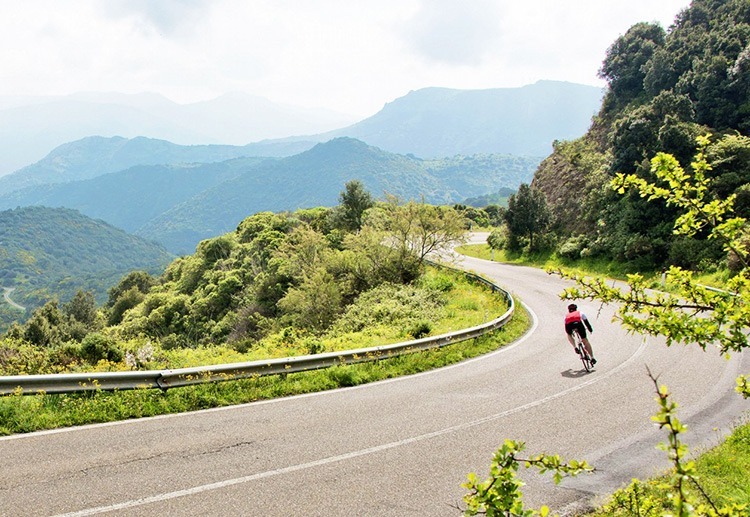 A classic self-guided road cycling holiday across Sardinia, for riders preferring to take on a coast to coast challenge at their own pace. We’ve chosen a beautiful route that alternates between Sardinia's gentle coastal roads, vast plains, steep climbs and thrilling descents. An incredible holiday which takes you deep into the heart of this magical island. Starting in the south west of Sardinia near Montevecchio, you’ll set off through hills carpeted with lush green maquis vegetation, towards the towering sand dunes of the Costa Verde, where your coast to coast adventure officially begins. From here you’ll continue through olive groves and vineyards, unique and fascinating archaeological sites and lush green oak woods as you head off into a spectacular mountain landscape. Highlights along the way include a challenging but rewarding ascent into the stunning Gennargentu Mountains and an exhilarating descent of the limestone Supramonte Mountains of Baunei to the stunning Orosei Gulf where you can take a well earned dip in the emerald waters. You’ll spend your last 2 nights in the picturesque coastal resort of Cala Gonone near Dorgali where you can chill out or do an additional loop ride and then celebrate your achievement with one last Sardinian feast. With detailed route notes, maps, luggage transfers and your accommodation arranged in advance, all you need to think about is the splendid scenery and the amazing cycling, yours to enjoy at your own pace.